For those who might not know who Linda Vaughn is, let us briefly fill you in. Back in the day, there was a lady known as “Miss Hurst Golden Shifter” of Hurst Shifters, back when more people actually drove manuals. She is considered the first lady of motorsports, and had a long career as such. In Linda’s name, 500 Chevy Camaros, called the LV-1 will be a part of a limited production run, courtesy of Barrett-Jackson. 400 units will be coupes with half featuring a white and gold color scheme, and the others will be dressed in black and gold. 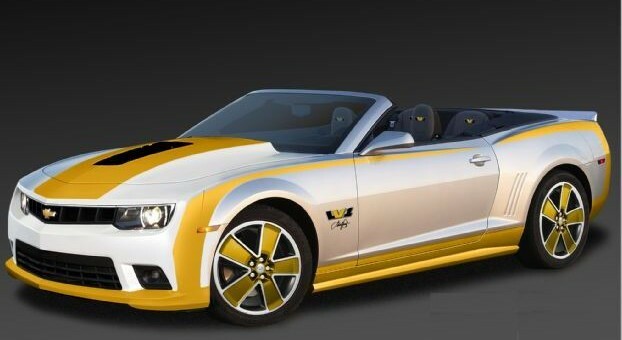 The final 100 will be convertibles, all having the same color combos. Along with the fancy paint, all four corners will feature gold accents. On the inside, embroidered headrests with “LV-1” are standard. If you went to SEMA, you might recall seeing two of these Camaros. It will be these two that Barrett-Jackson will also auction off. All proceeds are headed to the Dreamakers organization, who will then pass it along to The International Kids Alliance Network (IKAN), an organization dedicated to help combat illiteracy in children. Considering it’s Linda Vaughn, I figured I’d read that proceeds would go toward breast awareness.. I mean breast Cancer awareness. Still, fighting child illiteracy is an equally great cause. Good for the IKAN!